does anyone remember where Clouds Disco was. I spent many a happy night there - I have a feeling that Gary glitter and his band played there one Xmas in the early 70s- would I be right. Perched on top of the Apollo, initially Clouds Disco and then the renamed Satellite City was a little night club that saw a number of gigs by well known artists. Simple Minds played their first ever gig at the venue which also hosted Fumble, Elvis Costello, Stone the Crows (supported by the Sensational Alex Harvey Band) and Midge Ure's Rich Kids. Salvation who later became Slik were regulars at Clouds, playing covers of current hits to the enthusiastic Glasgow punters. Jim McGinlay of the band wrote "I think being booked at Clouds so often was the making of us. It's one of the most popular discos in Glasgow, and word gets around up there when a group gets on well at Clouds. Bill Martin had been told about us because Phil Coulter was working with Billy Connolly, and Billy came up to Glasgow to see us at Clouds." The Simple Minds gig was as support to Steel Pulse, as well as Rev Volting And The Backstabbers (later became Fun 4) and The Nu Sonics (later became Orange Juice). PassforSimpleMinds1978.jpgJim Kerr appeared with a pudding bowl hair cut and sombre priest's frock coat. "On the dance floor the standard disco clientele dance to standard disco records. On tables down the sides hippies (here for the reggae presumably) stick Rizla together. Reeking of new leather, punks patrol the perimeters, trying to look as subterranean as possible. Orange Juice still play a song about the event." Glen Gibson. British rock and roll harmony outfit Darts played at Satellite city in November 1977. Resident DJ at Clouds was Radio Clyde's Tiger Tim Stevens who apparently used to wear a frog suit! Emperor Rosco's Roadshow was also a regular feature whilst Richard Park (Fame Academy) was a regular DJ for most of the Apollo years. Also known as The Penthouse some of the 80's major outfits performed early shows there. Acts included Spear of Destiny (supported by the Orson Family) on 13th December 1983 and the Alarm (supported by Kissing Bandits) on 1st Feb 1984. In the early 1980's Clouds was used for many other purposes including judo classes and even as a roller disco. And the address is on this ticket. Hi stowst. On the red ticket it shows Renfrew Street but the green one shows Renfield Street. Wieso meine Dame, oder Herr? Simple Minds were a band who played in a pub called the Mars Bar which was in St. Enoch Square in the late 70's. They also played in the old third eye centre before making it big. I remember seeing a band that nobody had heard of in Sattelite City called "The Skids" and the main act being booed off the stage, Howard Devoto from the original Buzzcocks lineup. The cry went up " we want the Skids!" and so it was that these 4 young guys made it. 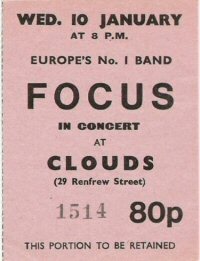 I remember hearing Simple Minds in the Doune Castle (Beir Kellar), Kilmarnock road in Shawlands. Most of the guys were from Castlemilk or the south side. This is a very good thread and I am indebted to 27stowst, Tam and others for their memories. If I can remember rightly the Clouds door policy was always quite contentious - "Not tonight lads" and so on. Mind you we often went after about ten watered down pints ex The Regency or the Waterloo - Stakis places selling McEwans 'lager'. Mars Bar was a good memory in Howard st I think of St Enoch's square. Does anyone remember T1 (Terminal 1) - it was a bit of a dive - right on St Enochs Sq about where the steps now are to the shopping centre. I remember well down stairs at the Dounecastle for the bands and upstairs for posers. What about Shuffles? (met Mrs Pumps100 there). The building was on the corner of Renfrew St and Renfield St. I think that, although the places were in the same building, the entrances were on different streets. Shuffles, Clouds/Satellite City, Mars Bar, Doune Castle... before long people will be mentioining Tiffany's, Nightmoves, Burns Howf and the Muscular Arms. Memories of too much tepid McEwans Export, whisky & coke and Sweet Black & Tans!!! I believe you may have missed out the T1, Alhambra, The Regency, Waterloo, The Redhurst, and on drinks front what the sophisticated lassies drunk Moscow Mules. Tepid McEwans Export? What about that p**h that was McEwans lager - I'm sure trading standards nowadays wouldn't allow it to be sold (usually in the Stakis places). Alec Waterson and his Burns Howf - what a gold mine. I recall he had a boy that had had a charisma bypass. Whatever happened to the Jean Armour? ah the memories are aw coming back, aw the auld pubs, the howf was good if yi could get in, the hunting lodge wis fantastic, many a guid time up there. the horseshoe bar as well, the scotia, the clutha the sarry heid, i`m jist gaun ti lie doon ma heids birlin.